Summer blooms are charming with their pastel shades of peach, pink and cream. But it's the flowers of fall that arouse mature passions as gold, plum, ruby and bronze blossoms unfurl. This is the season when gardens can look truly stunning and lush, and anyone who's tempted to pack up the trowel until spring should reconsider, say professional gardeners. "By the end of summer you've battled the heat, the bugs and watering, and you want to hibernate in the fall. You should come out and garden instead," says Stephanie Cohen, a Collegeville, Pa., gardener and co-author of "Fallscaping" (Storey Publishing, 2007). Once you embrace autumn as a gardening time, you'll find a wonderful variety of flowers to grace your garden. You'll also find bargains as garden centers clear space for winter, Cohen says. Here are some ideas. "If you want something that jumps out at you, you're talking about annuals," says Nicholas Staddon, former director of new plant introductions for Monrovia. 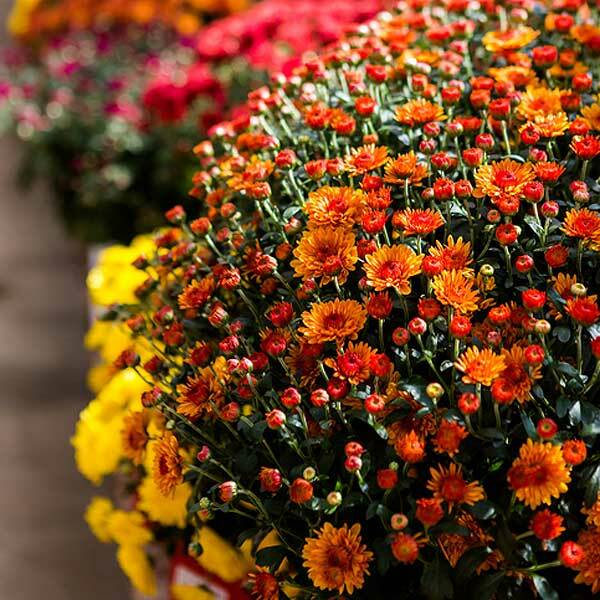 Mammoth mums, an annual that's "extra" prolific tops his list. "There's a [mis]conception that mums are tender, but the new varieties are very hardy," says Staddon. Pansies are another surprising suggestion. One new type, ice pansies, can actually take frost, says the plant director. This is also the season when asters reign with their bountiful floral displays. The aster plant (either annual or perennial) isn't impressive during the summer, but is worth the wait once it blooms, says Cohen. Some of summer's most popular annuals, including zinnias, nasturtium, marigolds, cosmos and flowering tobacco will thrive now. If you didn't sow the seeds in late June, buy flowering plants. You can also add petunias or bachelor buttons to containers that are getting a little sparse, says Cohen. Grasses with their stunning plumes are a must-have for the fall garden, say Cohen and Staddon. "Go for grasses showing autumn bronze or reddish autumn colors. They're now in full plume and can be purchased in one- to five-gallon containers," says Staddon. He likes Calamagrostis Karl Foerster. "It will stand like a squadron of British soldiers. This is a wonderful display of grass," Staddon says. Bev Bennett, a veteran food writer and editor, is the author of "Dinner for Two: A Cookbook for Couples" and "30-Minute Meals for Dummies"